This post captures my entry into the Adafruit Extra Credit / Circuit Playground contest of 2017. 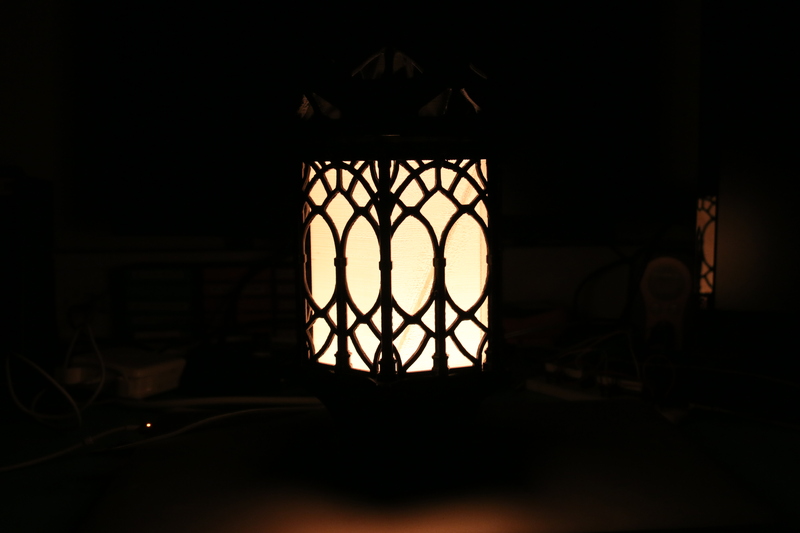 I made a fun, interactive ‘Scary Smart’ Gothic Lantern which I will describe in this post. I bought the Adafruit CircuitPlayground Developer Edition when it first came out and gave it a try — it was a fun little board and was something I’d tinker with on a long flight and recommend to friends starting out, but I didn’t have a solid use for it, in terms of a project as by the time I got it I had progressed in my electronics/maker projects to the point where I was designing my own boards etc. 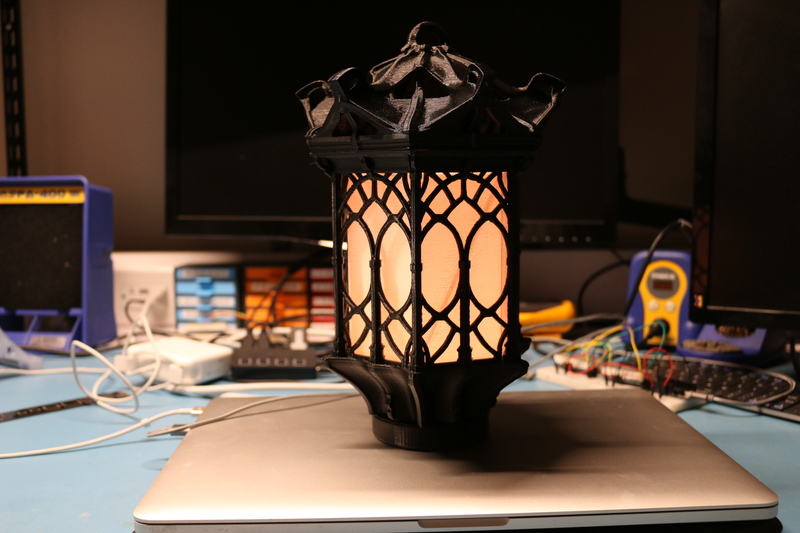 Then I saw the folks at Adafruit post about building this great looking Gothic Lantern and added a small enclosure to house a circuit playground to light it up and it really resonated with me. Once I built the lantern and enclosure I decided to build a lid for that electronics enclosure as I didn’t like seeing some light showing through from the space between the enclosure and the base of the lantern. My lid fits snugly into the electronics enclosure and blocks any light from coming out of the base. 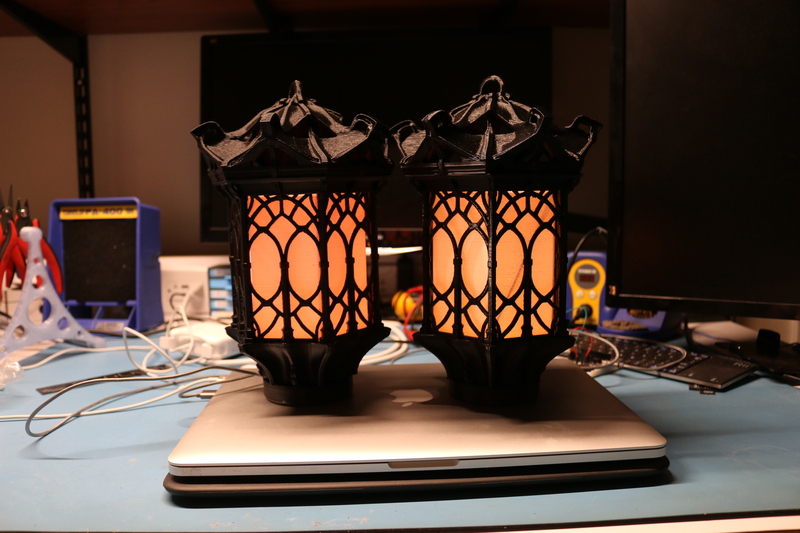 I printed my lantern from Polymaker PolyLite PLA (Black and White). I used M4 x 30mm flat head machine screws and nuts (Qty 4 each) to attach the electronics enclosure and lid to the base of the lantern. I found the lid (via how the lantern model was designed) to be a bit too loose for my liking so I added a piece of black electrical tape to the male pins on the top of the lantern and it did a great job filling space and adding friction so the lid stays on the lantern if you want to hang it. To take things a step further from just the build I decided to write a series of animation/demoes for the lantern to add some fun interactivity to the project and to use as many of the sensors as I could work into a lantern project. Flickering Candle — custom modified algorithm to simulate what to me looks like a fairly realistic approximation of a candle. (Flickers, goes dark in places etc. Temperature — Cycles through an animation of Blue -> Cyan -> Green -> Yellow -> Orange -> Red (simulating the range of colors used to represent the temperature in this demo), then strobes white 3 times and then shows the ‘color’ of the current temperature reading. (Blues are cold, Green room temp (68F +/- 4 degrees), Yellow a bit warmer, Orange getting warm and Red is HOT. It was a lot of fun to build this project. If you build one of your own, please leave me a comment or share a make on Thingiverse or similar. Pingback: 3D Hangouts – Acrylic & Nintedo Switch Projector « Adafruit Industries – Makers, hackers, artists, designers and engineers! 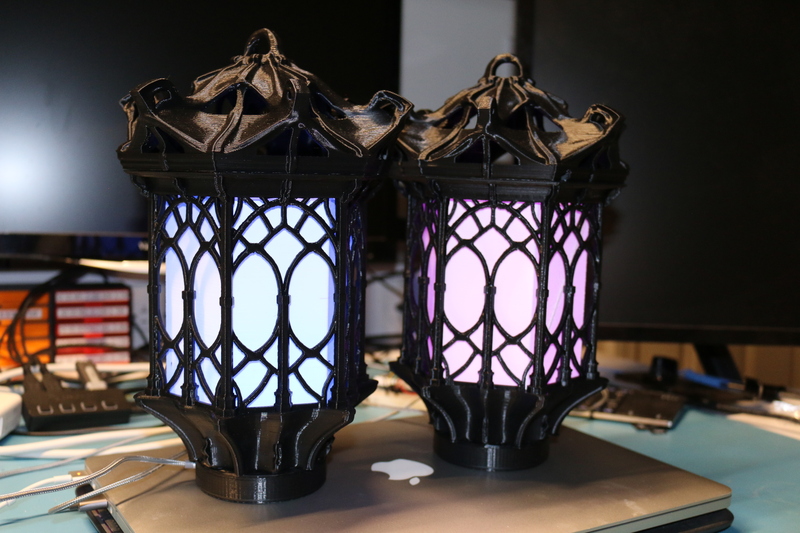 Pingback: Circuit Playground Gothic Lantern Update by @TinWhiskerzBlog « Adafruit Industries – Makers, hackers, artists, designers and engineers!